It has been a brutal February, not just cold, which I can deal with, but snowy and icy–pretty much my least favorite riding conditions. Riding on ice is the worst because eventually you have to stop or turn, and doing either of those things means risking a fall. I ride with such trepidation in those conditions, body all seized up, gripping everything too tightly to function, and it just isn’t fun to ride a bike that way. Spring can’t come soon enough, but it’s taking it’s own sweet time, and that’s the thing about weather–you just have to do what it’s going to do, and sometimes that means taking the bus. So that’s how I’ve been getting around, and oh, I miss the sense of freedom that comes with being completely self-powered! It’s like I’m not connected to the world in the right way when I’m not on wheels. We had a warm up on Monday, though, melting through the ice storm that came through the night before. It was a balmy almost-40 degrees, so I took the Surly out for a short ride down to the bike shoppe to order a front rack and a two-pronged kickstand. This is the summer I take up touring with my touring bicycle, and I’ve been spending a goodly amount of off-bike time fantasizing about where we’re going to go–and in July, we’re going to the Adirondacks. I’m so excited. Until then, though, I’ll take the blue skies between storms to ride around Baltimore and catch a glimpse of views like this one, up the Gwynns Falls Trail on the way to Druid Hill Park. Oh, biking, you are just around the corner, waiting for us to rediscover each other, aren’t you? 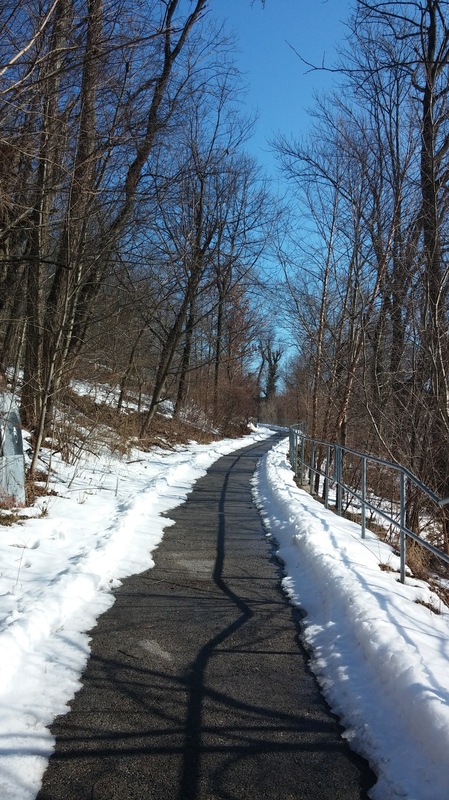 This entry was posted in bikes, personal, weather and tagged Baltimore, cold weather, Gwynns Falls Trail, winter. Bookmark the permalink.